Essence Circus Circus trend edition reached our country. Well, most of it. We’re missing one nail polish shade – no. 02 Don’t feed the tiger. Creme part of nail polish duos are fantastic. They’re easy to apply and glide onto the nail, are one coaters and I didn’t need to use fast drying top coat at all. In all swatches I used one coat of base polish and one thicker coat of glitter top coat. Red combo was probably my favorite. 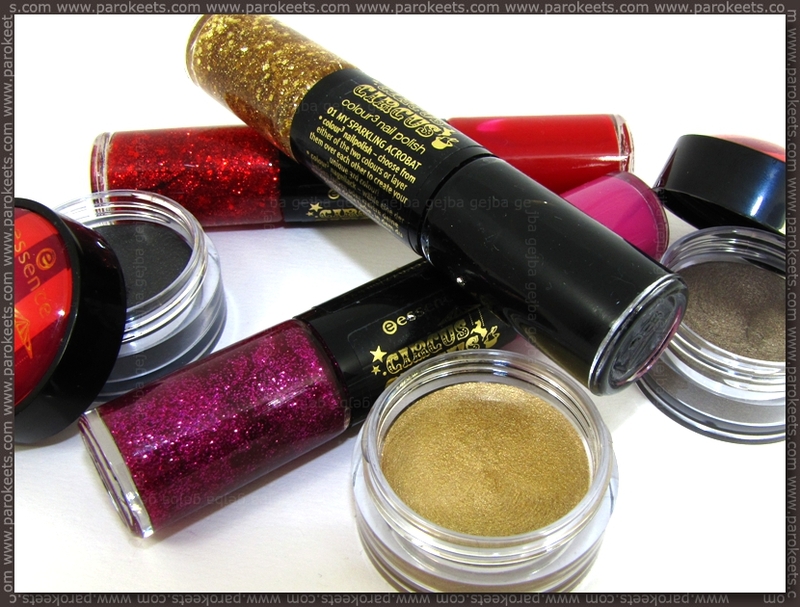 Essence Applause, Applause glitter is more subtle and it doesn’t stand out as gold on the black does. Stay all day eyeshadows I simply loved. My favorite color-wise is It’s Magic – gold shade. It spreads easily and works great as secondary primer on my oily eyelids. Essence Raise The Curtain For … will probably be the one that I’ll use the most. Color is not as green as on the photo – it’s more brownish. My Sparkling Acrobat I got for my birthday so I already wore it couple of times. I used 2 coats in the below photo, you can see how one coat looks at the video. This creme eyeshadow reminds me formula-wise of Ballerina Backstage Grand-plie in black, but it has longer staying power and lots of fine shimmer. I like it mainly because it deepens the color of the powder eyeshadows I use over it. While It’s Magic is easily applied with the brush, other two seem to need little bit more heat to spread easily … I guess cold weather doesn’t agree with them. 2,75 EUR for 5,5g (0,19 oz) of eyeshadow (expiration date 12 months after opening it). See anything worth buying from Essence Circus Circus TE? It’s one of the Abbamart Bubinga Toray Creme Eyeshadow brushes … not sure if it’s medium or large. Ful sem vesela, da obstajate :D (čeprav moja denarnica ni tako zadovoljna :P). Te dni sem našla vašo spletno stran med iskanjem po googlu in je zares super, ker vse opisujete in ocenjujete. Tako je pol lažje izbrat stvari za nakup. I really want the gold one, but they’re not sold in the UK. Boo! But I did hear that you got them in meanwhile, so hope you got everything you wanted. Hvala za lepe swatche! :ahug: Dvostranskih lakov ne maram preveč. Pri Essence so ustvarili luštne kombinacije. Rdeča se mi zdi še najbolj originalna, ostale so že velikokrat videne. Senčila izgledajo mamljivo. The eyeshadow it’s magi is awesome! Original no, quality wise they’re great though. Lakec My Sparkling Acrobat mi je prelep! Škoda da nimajo Don’t feed the tiger! Jaz možno stiskam pesti, da pride manjkajoči lepotec v DMe. Crveni lakici su mi naj, i ove dve tamnije senkice, bice dobro ako kolekcija stigne do nas, bas je prava praznicna! :drool: Gorgeous!!!! I want everything!!! A DM-i pa nimajo Cirkus Cirkus look-a? I think I’ll go for the first duo polish and all the eyeshadows! 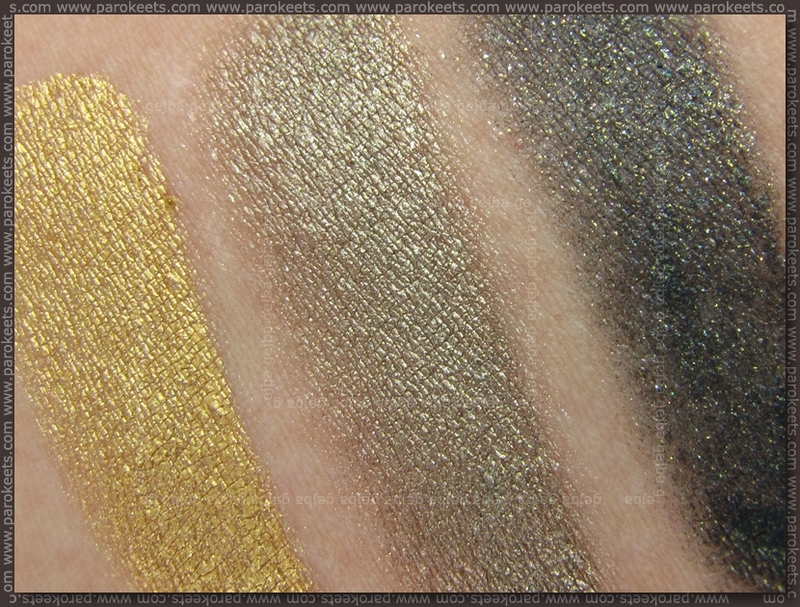 Eyeshadows simply rock. I wonder how do they far on those with “normal” eyelids. Senčke :sigh: Spet neka stvar, ki jo bom lovila po trgovinah. Čeeeeprav si zlate najbrž ne bi kupila.